Most of my life has been spent in the small bedroom community of Andover, Kansas. My little town is new and urban. It has no downtown. Every single main street building has long since been razed. But Andover has a past. As a runner I have covered most every local neighborhood many, many times. A few years back I started running through the ever shrinking “old Andover”. Now the area is nothing more than a couple blocks of small mid century homes. Back, one block off Main Street, nestled on a partial dirt road on Church Street I found a beautiful, historical relic – an old church. The details of the following story run through my imagination as I run the very steps of Andover’s early heroes and martyr. IN 1898 the small town of Andover, Kansas, had a brief fling with the “Wild West.” A train robbery led to an eruption of gunfire in the then-tiny community. But there might not have been one shot fired, had two wanted criminals not chosen the wrong Saturday night to commit their crime. Andover was served by the St. Louis and San Francisco Railway. The “Frisco” had built through the area in 1880. The citizens of Bruno township had voted for $18,000 in railroad bonds. Once the line came through the township Andover was platted and established. McClaren left the social on time. He probably passed by the blacksmith’s, and may have seen two men tying up their horses. The men followed Agent McClaren into the depot, and one of them bought a ticket to Augusta, the next town along the line. As McClaren was preparing for the train’s arrival, the two men revealed their intentions. They drew pistols and ordered McClaren to hand over all his cash and checks. The agent gave them about $45.00 in cash and $50.00 in checks signed and made out to a local creamery. The men then ordered him to flag down the train. The Frisco didn’t have a name or number for this train. An 1886 schedule describes it only as an express passenger train, running daily, heading east out of Wichita, with a 9:55 PM Andover arrival. The train’s consist was probably a 4-4-0 American-type locomotive, a baggage car, post office car with express area, and several passenger cars. No one would have known why the train was stopping, but wouldn’t have been concerned. As soon as the train stopped one of the men leapt up to the locomotive’s cab. He ordered the engineer and fireman out of the cab, and kept them in front of the engine with Agent McClaren. His confederate entered the express car. There was only one unarmed express messenger guarding the safe. The robber ordered him to open the safe. He took the $400 or $500 that was in the safe, and left the car. It looked like a quick crime and a clean getaway. At that same time another man noticed one of the masked robbers jumping from the express car. He watched as the masked man was joined by a second, and the two ran for their horses. The man may have been at home, in one of the houses that stood near the depot. He ran onto the scene with a gun in his hand. It was pitch dark, so rather than trying to aim for the robbers, the brave citizen fired at the horses. He killed one of the villains’ steeds. The next day the Wichita Daily Eagle told the story of the train robbery. 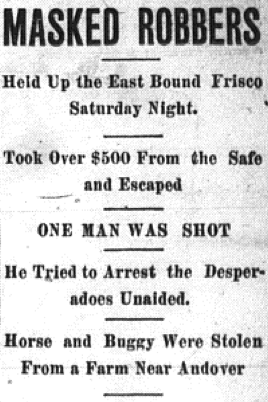 “Frisco Is Held Up,” the piece began. It offered descriptions of the two men: one was short and stocky, the other “tall, spare but muscular.” It speculated that the two may have been responsible for post office robberies in nearby Crystal Springs and Danville. There was also mention of the creamery checks being canceled. The next issue of the Eagle to add more details was Tuesday, July 19. Under the title “Are Under Arrest,” the account included a report of a horse and buggy stolen from a farmer in southeastern Sedgwick County. The major news was that two men fitting the description of the criminals had been spotted in Maize. After taking precautions not to start a gunfight authorities apprehended the men. Unfortunately the suspects could not be positively identified as the Andover train robbers. A day after their arrest they were set free. It appeared that the hand of jjustice would not catch the guilty men. Then, on August the 4th, news came from the town of Nowata, Oklahoma Territory. Two men, Samuel Smith and Tom Wynn (or Winn), had been taken into custody on suspicion of robbing the Frisco train at Andover. Wynn was from the Territory, and was either a half-breed or full-blooded Indian with a criminal record. He met Smith in Kansas’ Lansing prison, and they’d escaped together in earlier that summer. Smith was in prison for an 1897 reign of terror in Cowley and Sumner Counties in southern Kansas. He would ride up to isolated farm houses and demand the family’s valuables, threatening to shoot the women and children if not satisfied. Smith had been wounded in the Andover robbery, but not seriously. For a short time he and Wynn hid at his father-in-law’s house near Belle Plaine. When he was captured Smith was disguised as a clergyman. He tried to shake off his pursuers first by shooting at them, then by hiding in a mud-hole. The scene in Andover as the train pulled into town can well be imagined. Anyone who had a gun probably carried it. There was talk of lynchings and other acts of “frontier justice.” Angry shouts and cries could have been heard inside the car. A few local people were brought on board to identify the robbers. The train continued on, arriving in El Dorado on Monday, August 8, 1898. The two accused felons spent the next few months in the El Dorado jail under heavy guard. Depot Agent McClaren was brought in, and positively identified Smith and Wynn. Smith’s family hired a lawyer from the Kansas City area to represent him. The actual charges against the men were held up until the condition of Will Belford, the only man seriously wounded in the robbery, was resolved. On August 22 Belford died. He was shot in the spine, and had been paralyzed. It’s unclear how Belford received his mortal wound. An early report of the hold-up said that an unarmed man had tried to stop the robbers and was gravely wounded. Later reports suggest that Belford was hit in the general melee that occurred as Smith and Wynn fled town. Smith tried to escape his death sentence two years later. His attempt was an failure; he was shot by prison guards, and died of his wounds. Wynn successfully escaped in November 1912. He was recaptured three months later, but was set free in 1914 when the governor commuted his sentence. Wynn was not seen in Kansas again; it’s likely he returned to Oklahoma and lived out his life there. Andover changed as the memories of the Frisco robbery faded. The blacksmith shop where the bandits tied their horses was torn down in the 1910’s and the Andover State Bank erected its first building on the site. The bank moved south to a newer building decades later, then moved south again a few years ago. The first bank building is now home to the Andover Historical Museum. Depot Agent McClaren remained in Andover, and later owned the lumberyard. The Frisco depot served the community for several decades. When passenger service to town ended in 1960 the depot was abandoned. It was almost saved by the Great Plains Transportation Museum in Wichita, but terms weren’t agreed upon, and the depot was torn down and lost. The last business building from that era was the old general store. The store’s indented doorway served as a haven for those trying to hide from the bandits’ bullets. The store went through several owners, different uses, and although the historical society tried to save it, the building was torn down several years ago. If they didn’t know about that ice-cream social, Smith and Wynn made a serious miscalculation. They chose the wrong place and the wrong time. The first gunshots or McClaren brought the mob. That in turn created witnesses, a shoot-out, and a death. Either way, it was the error of the timing of their crime that led to the downfall of the two train robbers. 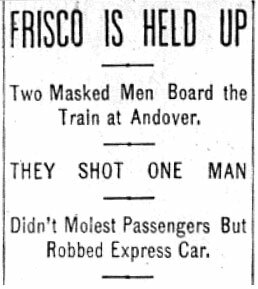 It was this error that distinguishes the Andover train robbery from the usual “Wild West” banditry. About the author: Robert Collins has had stories and articles appear in periodicals such as Model Railroader; Marion Zimmer Bradley’s Fantasy Magazine; Pyramid; Hadrosaur Tales; Of Unicorns & Space Stations; Fantasy, Folklore, Fairytales; and The Wichita Eagle. His book, The Electric Way, about the Arkansas Valley Interurban railroad, was published in 1999 by South Platte Press. He has had three other railroad books published by South Platte Press. Mr. Collins, a member of the Kansas Writers Association, also has written and published a series of nine local travel booklets from 1992 to 1995.